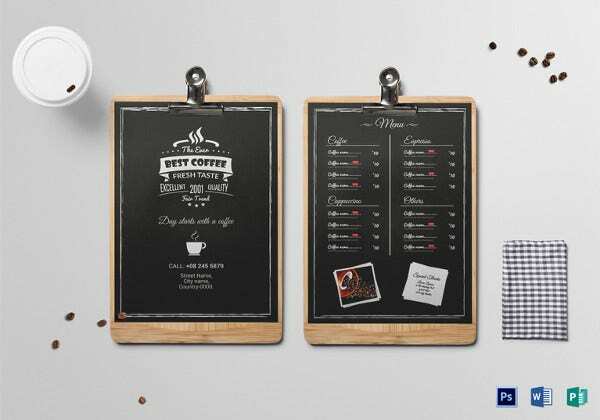 30+ Coffee/Cafe Menu Templates – Free PSD, EPS Documents Download! If you’re feeling hunger pangs for a quick snack or short meal, you can rush to a cafeteria. 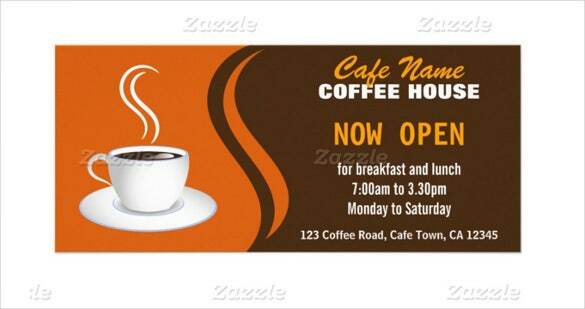 Nowadays cafeterias are as good and popular as any of the restaurants. 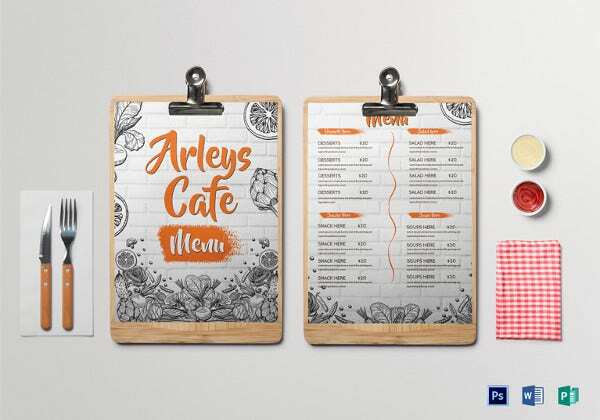 Menus you’d find in a cafeteria is just as well-designed and elaborate – the plus of course that they’d have a tall lineup of a coffee and tea beverages. 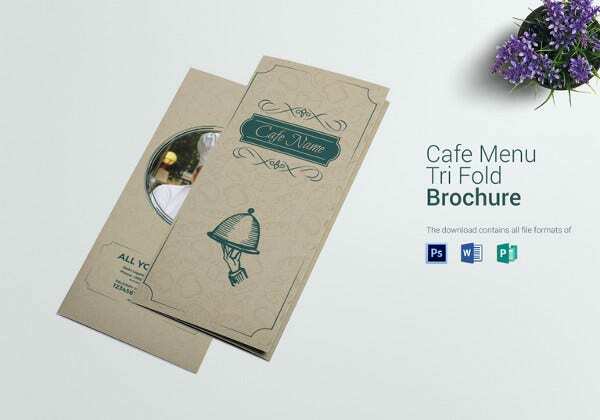 If you’re looking for interesting and attractive café menu templates, this is the page for you! 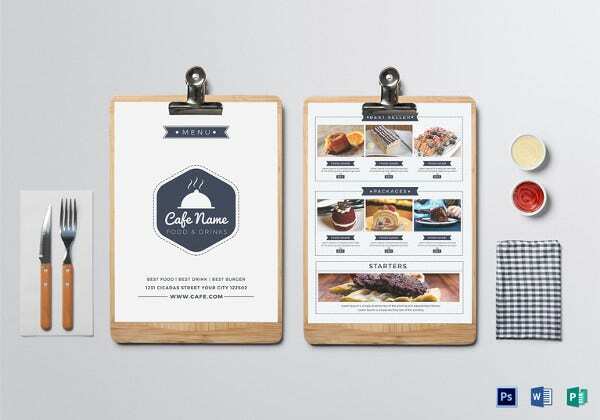 You could use a Dessert Menu Templates. 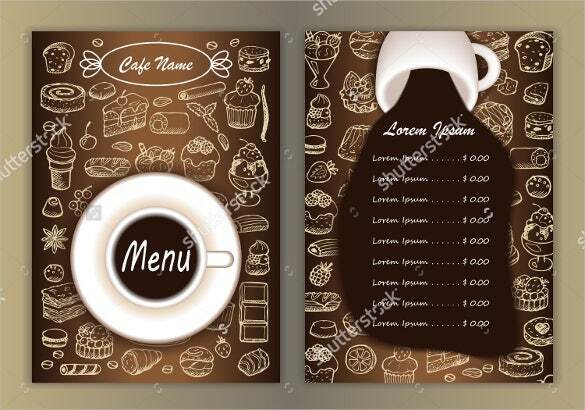 A Menu Templates Word would allow you to list all different cappuccinos and frappes you serve, along with finger foods which customers could nibble on as they enjoy their coffee. 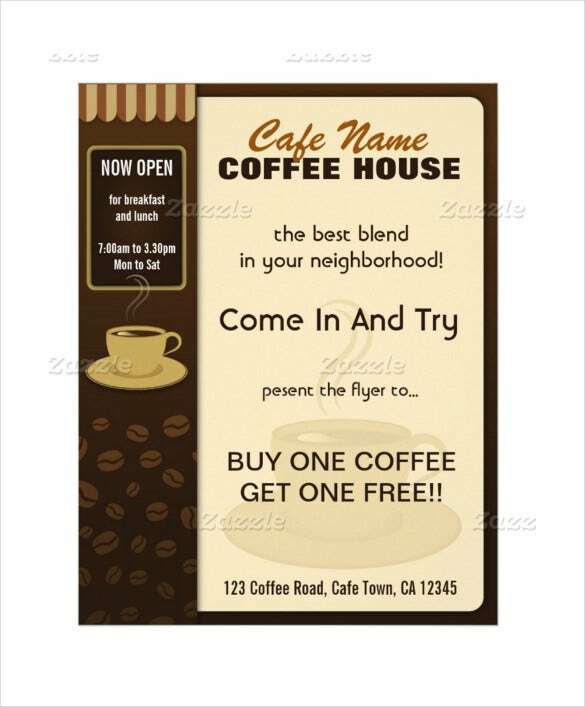 It would be a great way to promote your drinks, and win the appreciation of your customer. 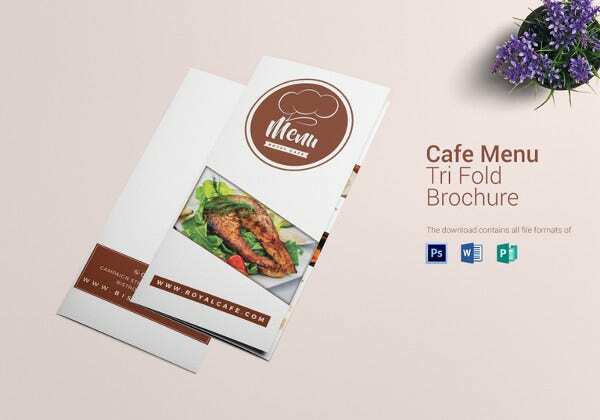 The Menu templates are designed and developed in Microsoft Word. 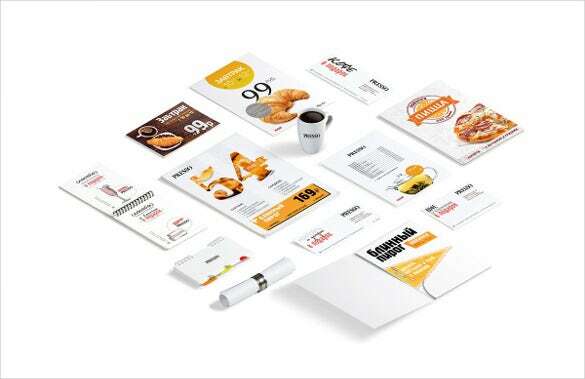 They are put-together quite comprehensively so regardless of the size of your menu, our menu templates are powered with all the qualities to accommodate n-number of foods in them. 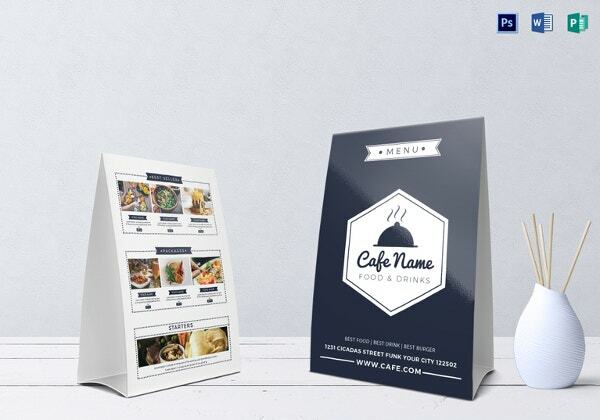 Be it beverage, snacks, finger foods…just about any café-specialty, our menu templates are game! 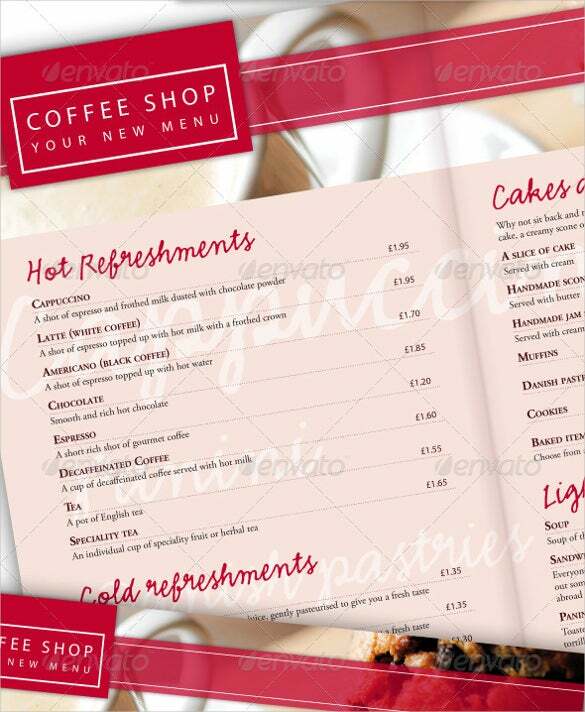 This PDF coffee shop restaurant menu template comes in a nice pink color with the items served in red. 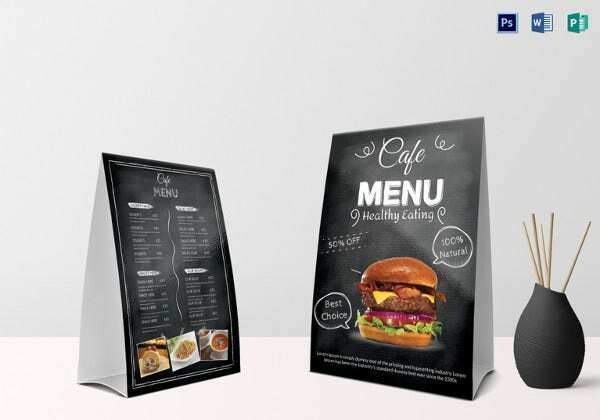 This menu is will help you get your customers attention on the choices they can choose from. 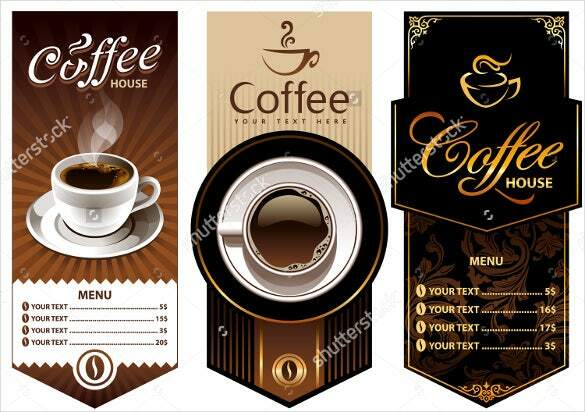 This three coffee menu design template come in three different designs and color. 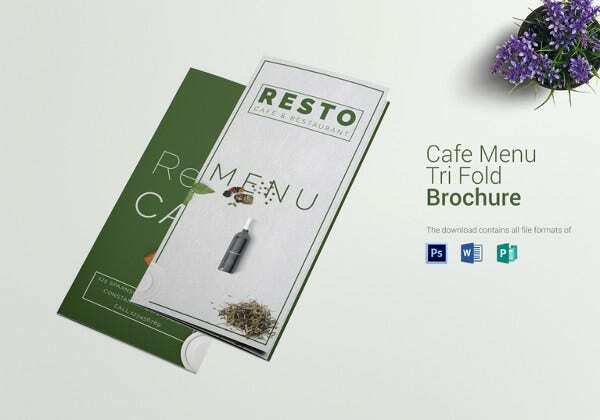 The Word menus have a distinctive sharp tip at one end of the menu which is a simple one page. 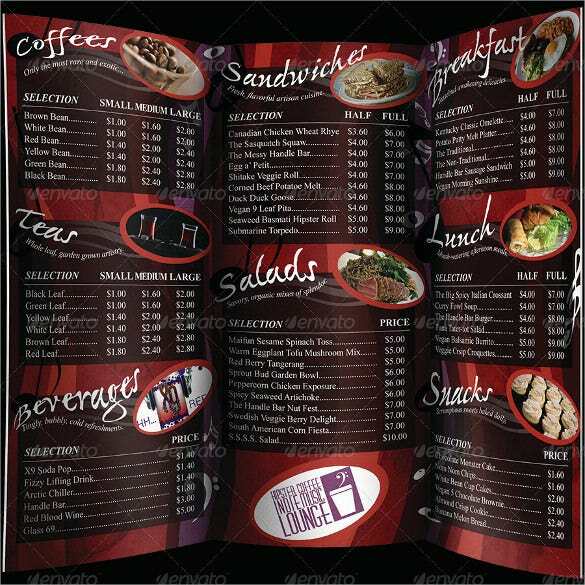 Having a nice menu is every premises offering food and drinks services dream. This Excel format café menu download that comes in a white color will make your dreams come true. 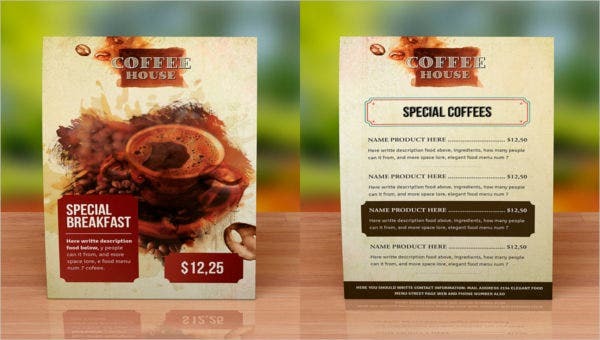 This PDF café coffee cup flyer and coffee menu template comes with the coffee colors. The flyer also comes with an offer. This flyer is the best way to get your business recognized. 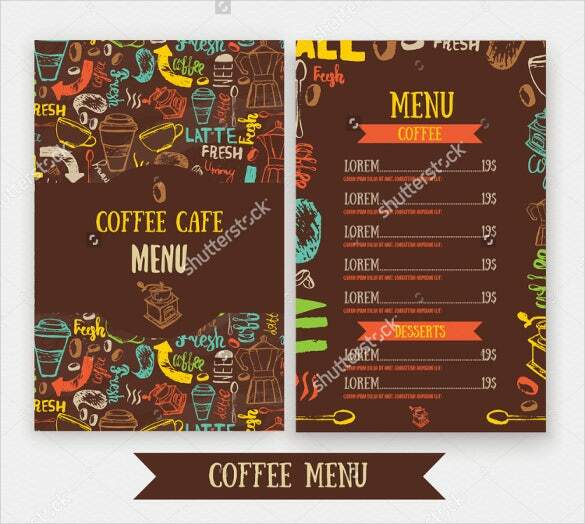 This Word coffee music café tri fold menu comes in black coffee and red colors. 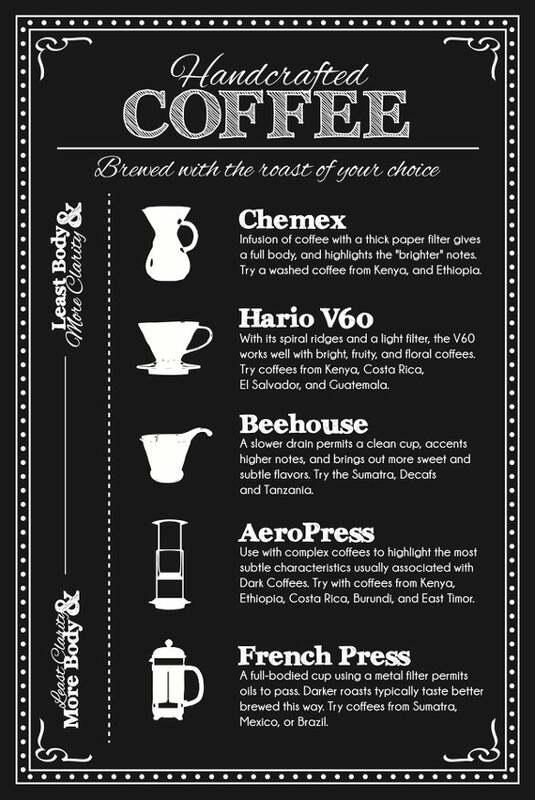 You can download this menu to get you coffee menu under way and have a nice looking menu on your table. 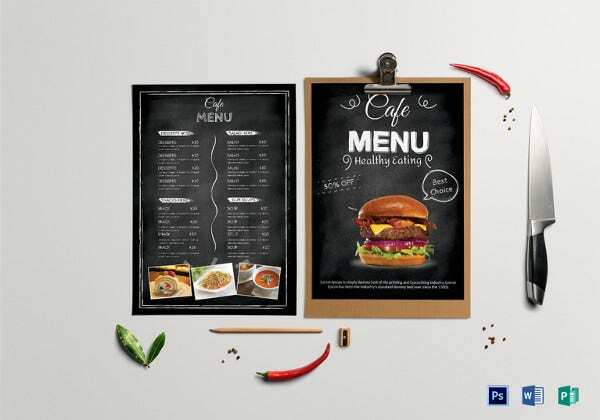 The first impression to any restaurant is made positive by a good looking menu. 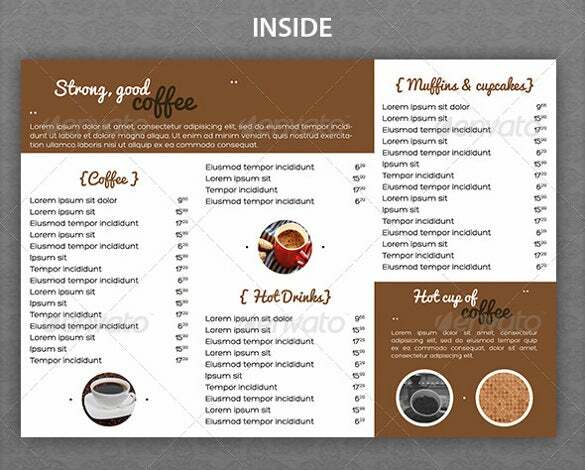 This Excel format printable coffee menu template will give you that warm reaction from your customers. 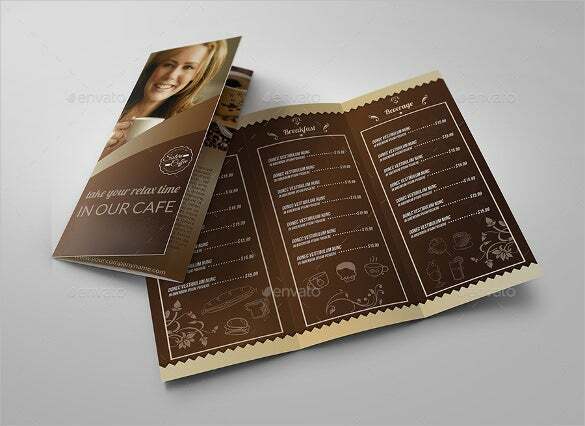 This PDF template comes in a coffee brown color with the items written in white. 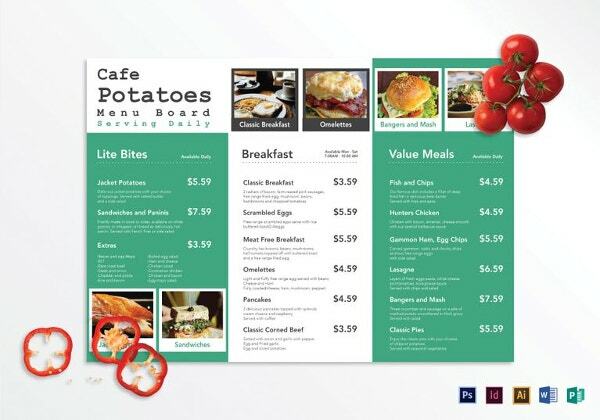 The menu has a smile lady on the front page giving the menu an appealing feeling to it. 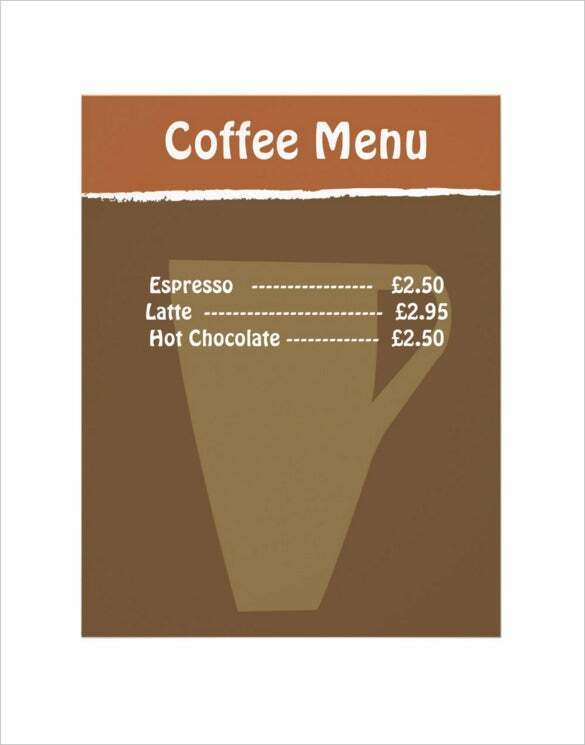 This Word coffee chalkboard menu template is on a wall giving the customers a clear view of the items offered in the restaurant. 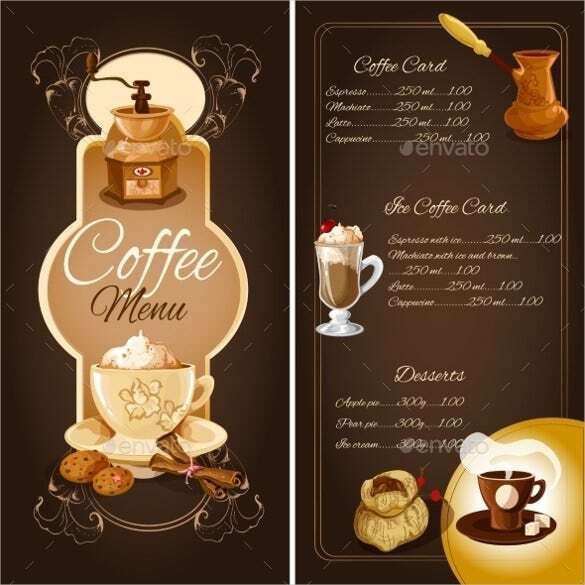 The menu also has coffee cups with the ingredients and price in them. 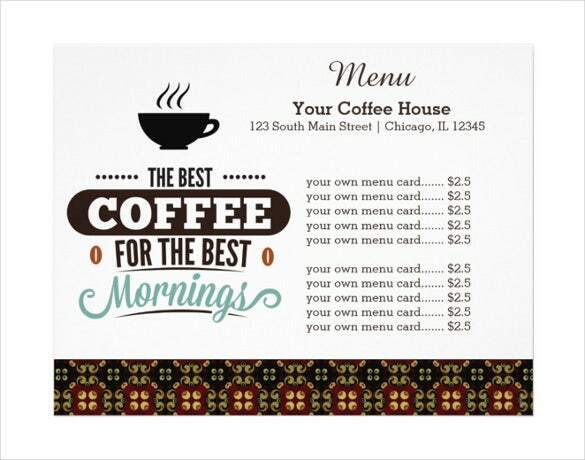 This Excel format coffee house menu template is a simple single page menu. 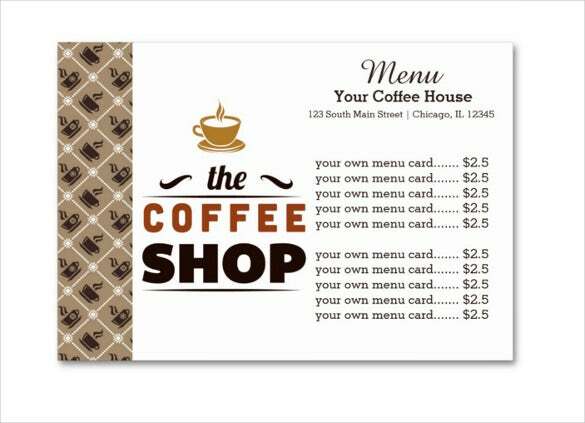 The coffee shop name is on one side with the type of coffee on the other side of the menu. 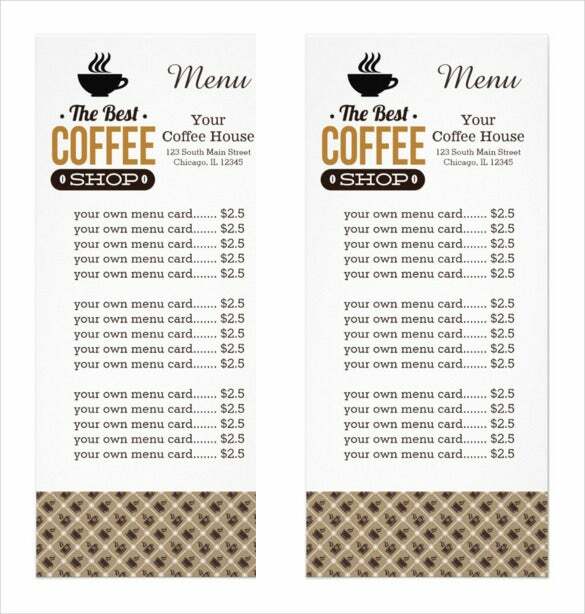 This PDF elegant coffee house menu comes in white with coffee beans on top of the page. 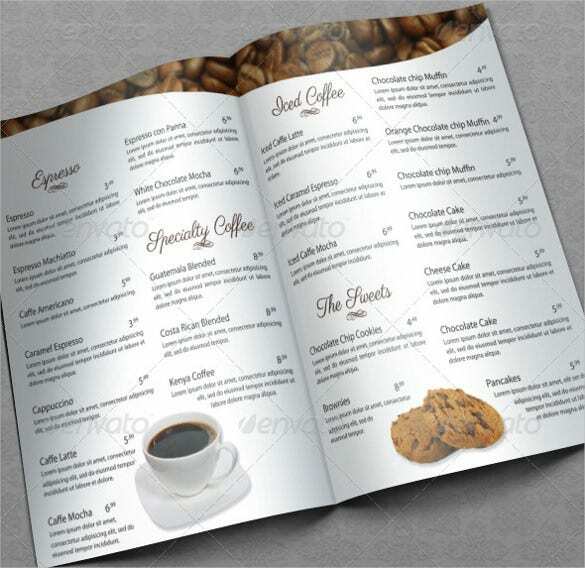 The menu has the items written in light coffee color giving it an elegant look.